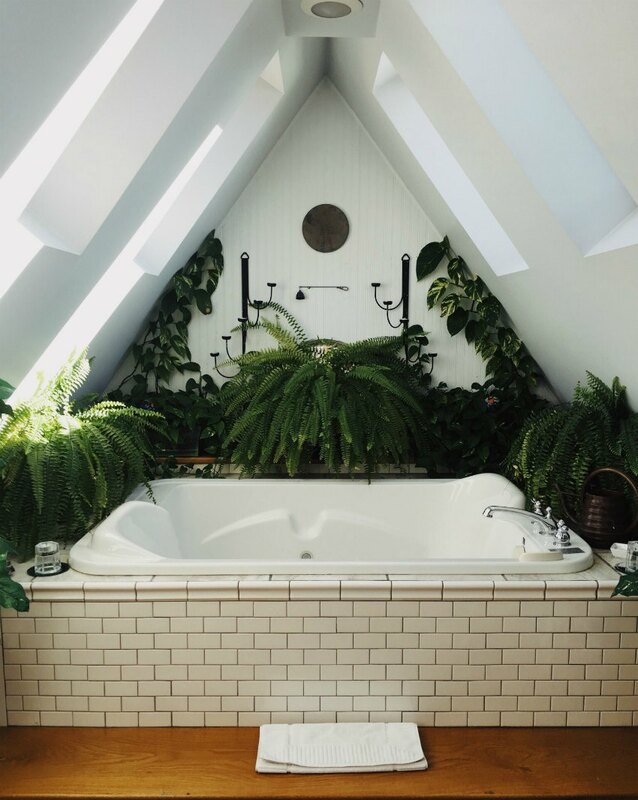 Let’s talk about flushing medicines (and illegal drugs) though. 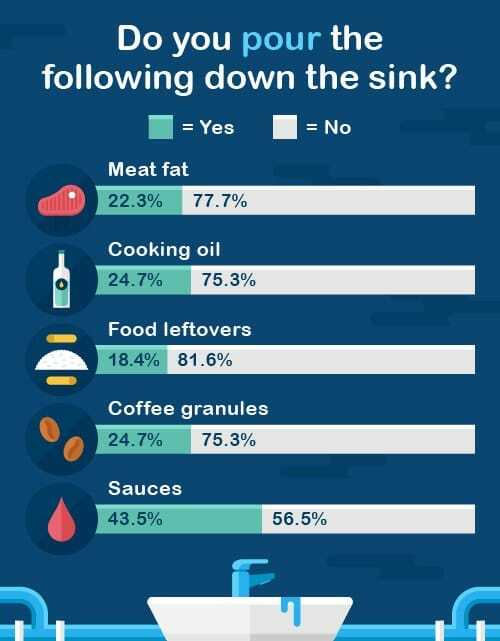 Flushing these items can have severe implications for the environment – from causing starlings to feed less to reducing fish population sizes. The best place for unused medicines is to always take them back to the chemist. They won’t be reused by anyone else but they will be disposed of safely. Wasted or unused medicine is a big problem within the NHS. It is estimated that as much as £300million is wasted every year on unused or partially used medication which cannot be recycled or re-used. A campaign called Only Order What You Need, working with the NHS, asks people to think carefully before ordering repeat prescriptions to help avoid this wastage. 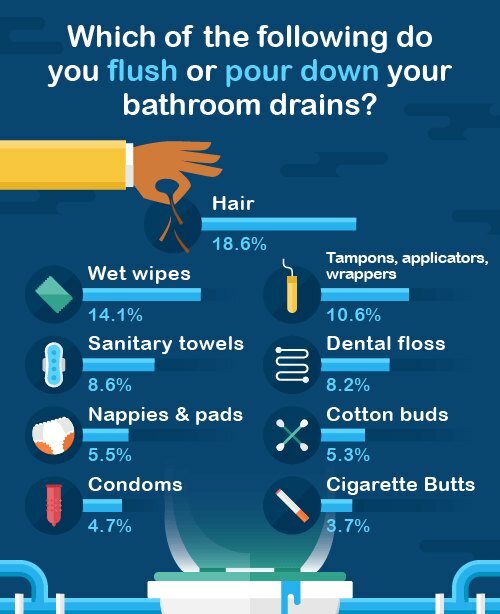 Whilst hair is the biggest offender of items regularly flushed (it’s actually best to compost hair) it’s most worrying to see wet wipes being the next most popular item to be flushed. Wet wipes are behind 93% of blockages in UK sewers, and contribute massively towards fatbergs – the giant obstacles that block sewere and have growing health and environmental problems. Wet wipes aren’t the only environmental disaster to be flushed down the toilet though. 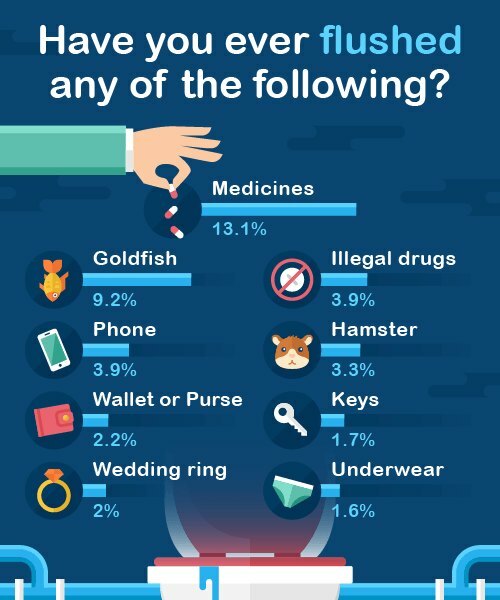 From sanitary towels to nappies, from condoms to cigarette butts, and everything in between, the official advice is that none of the items on this list should be flushed down the toilet. All of these items can lead to the pollution of beaches and rivers, with items travelling from the toilet through the sewage system and into the marine environment. If it’s not a bodily fluid, and if it’s not toilet paper then the advice is don’t flush it! Whilst not necessarily terrible for the environment, these fats, oils and greases can solidify in your pipeworks, causing blockages.